Astronomers using NASA's Chandra X-ray Observatory have set out on a hunt, to look at as many planetary nebulae as they can! 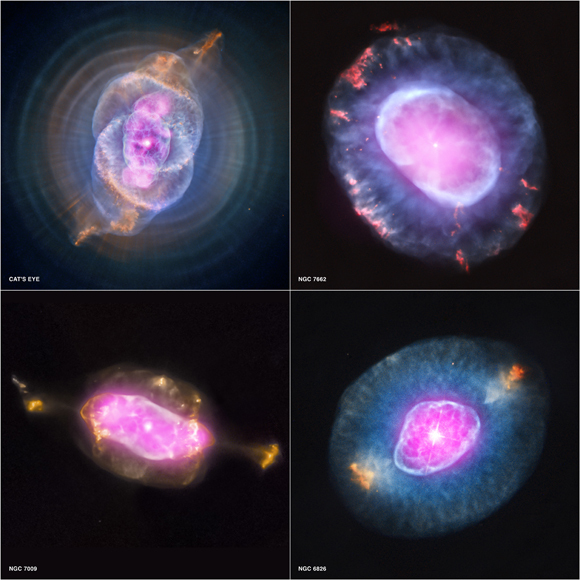 Planetary nebulae are simply glowing clouds of gas and dust, they actually have nothing to do with planets at all. Now astronomers are using Chandra to track all of these clouds within our part of the galaxy. 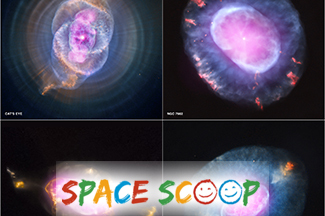 This picture shows four butterfly-shaped planetary nebulae that they've captured already! These clouds show us a phase of life that all medium-sized stars, like our Sun, eventually go through. When a star has burned all its fuel it expands, into an enormous Red Giant. The star can swell to hundreds of times bigger! At this size the star has trouble keeping hold of its outer layers of material. A large amount of material from the star's outer shell blows off into space. Gas and dust shed by the star forms a planetary nebula, which surrounds the white dwarf in a colourful cocoon. These gassy envelopes come in many shapes and sizes. In these pictures you can see the material has formed two symmetrical clouds which spread out on either side of the star. They look just like the wings of a butterfly! Cool fact: 95% of all stars will eventually become planetary nebulae, including the Sun. Astronomers think that there are probably over 30,000 planetary nebulae, just in our galaxy.